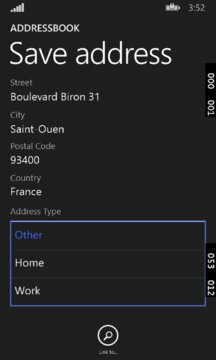 Find and choose locations on the map to save them in a contact, with AddressBook you can also share your location via SMS, Email, OneNote, Post on Facebook or any other app that accepts shared text. - One tap button to refresh your current location on the build in map. - Tap n Hold on map to pick up a location. - Choose between your current location and the one you picked to share or save. 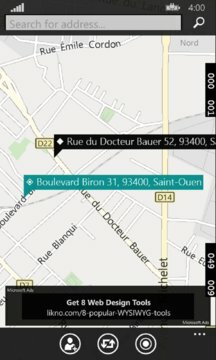 - Search bar to write an address and have the results of the build in map. - Few taps away to save the selected address on a contact of your choice. - An evolving application that can bring new features based on users demands. It’s a free advertisement supported application if you liked this app please rate with 5 stars, you can also buy it to support us and remove the advertisements. Your feedback is important to us to improve our application do not hesitate to contact us.